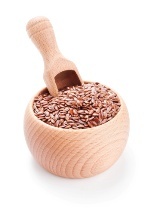 Flaxseed is still going strong in the world of medical research. A recent study has just reviewed the performance of these healthy seeds and has given them a glowing review when it comes to boosting health. If you haven’t added flaxseed to your weekly diet yet, now’s the time to give it a try. Just one serving a day could help protect you against these three major diseases: cancer, heart disease, and diabetes. These nutrients combined in flaxseed create a sort of shield against disease. Omega-3s play a role in protecting your brain by boosting spatial memory. PLUS: Use flaxseed powder to protect against Alzheimer’s. Protein boosts the performance of your muscles. Alpha-linoleic acid benefits your heart and could help lower stress levels. Fiber keeps your digestive system working properly, helping you to better absorb important nutrients. And minerals, of course, are needed to complete all kinds of functions in your body. As for the nutrient with the tongue-twisting name—secoisolariciresinol diglucoside—it could help prevent the development of atherosclerosis and diabetes. It does this, in part, by exerting a beneficial effect on cholesterol levels. Secoisolariciresinol diglucoside is an antioxidant phytochemical. Flaxseed is easy to add to your meals. You can sprinkle them on your cereal or toast at breakfast. You can add them to soups at lunch. You can purchase bread or muffins with flaxseed added. At dinner, you can add flaxseed to many common desserts. Don’t forget to give this healing food a try—it’s just too chock-full of nutrients for you to pass up! “Flaxseed—A miraculous defense against some critical maladies,” Pak J Pharm Sci. January 2013; 26(1): 199–208.